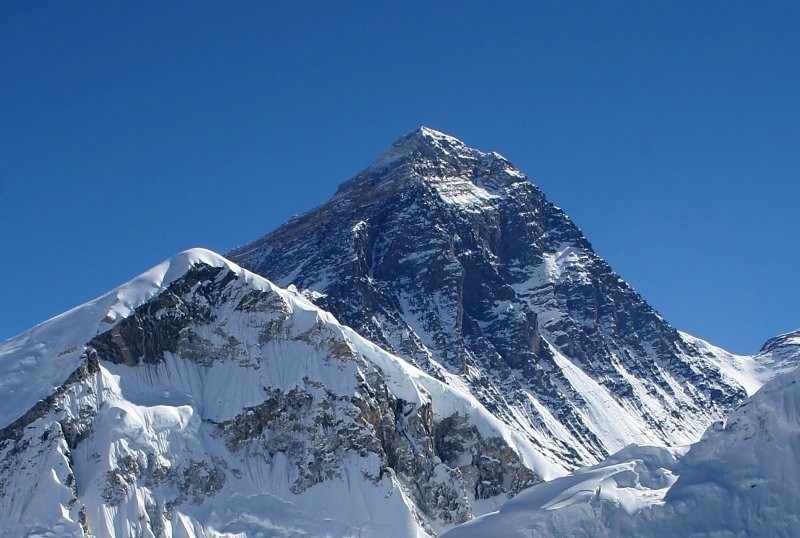 Mount Everest is the highest mountain in the world and probably the most well known. Part of the Himalaya range on the Nepal-Tibet border. Attracts experienced mountaineers as well as novice climbers using mountain guides to complete a successful climb. The mountain, while not posing substantial technical climbing difficulty on the standard route, still has many inherent dangers such as extreme high altitude, weather, and wind. Conditions are so difficult in the "Death Zone" (altitudes higher than 8,000 m) that most corpses have been left where they fell. Most attempts are made during May before the summer monsoon season, when a change in the jet stream reduces the average wind speeds high on the mountain. Mount Everest has two main climbing routes, the southeast ridge from Nepal and the northeast ridge from Tibet, as well as many other less frequently climbed routes. Of the 2 main routes, the southeast ridge is technically easier and is the more frequently used route. It was the route used by Edmund Hillary and Tenzing Norgay in their historic first ascent in 1953. The ascent via the southeast ridge begins at Base Camp at 5,380 m (17,700 ft) and heads up ropes and ladders through the treacherous Khumbu Icefall. Seracs, crevasses and shifting blocks of ice make the icefall one of the most dangerous sections of the route. From a Camp I, climbers make their way up the Western Cwm to the base of the Lhotse face, where Camp II is established at 6,500 m (21,300 ft). Then climbers ascend the Lhotse face on fixed ropes up to Camp III, located on a small ledge at 7,470 m (24,500 ft). From there, it is another 500 m to Camp IV on the South Col at 7,920 m (26,000 ft). On the South Col, climbers enter the Death Zone. Climbers typically only have a maximum of two or three days they can endure at this altitude for making summit bids. From Camp IV, climbers will begin their summit push around midnight with hopes of reaching the summit (still another 1,000 m above) within 10 to 12 hours. Climbers follow a knife-edge southeast ridge along what is known as the "Cornice traverse". At the end of this traverse is an imposing rock wall called the "Hillary Step". Once above the step, it is an easy climb to the top of Earth on moderately angled snow slopes.